I hope you enjoy this “Müller-Lyer Illusion” from 1889. When one bisects the horizontal line, it is quite normal that large errors are made, so don’t be annoyed or disappointed (I err by ≈ 10%). This phenomenon is placed in the category “size constancy” because I find the perspective explanation (see further down) very convincing. Müller-Lyer’s original figure showed two double-ended arrows, here I used the Brentano variant. When you place the mouse pointer over the picture, the blue lines indicate that the two red arrows are of equal length. 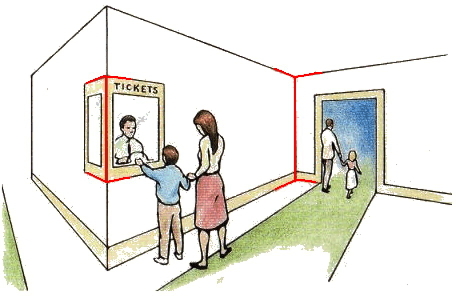 The arrow configuration “angles in” (near the ticket counter) is always the front side of an object, the “angles out” configuration occurs at the far end of a room, for instance (here next to the door). So, given no further information (as in the Müller-Lyer arrangement at top), the brain assumes the “angles in” configuration to be closer, computes size constancy on it, and –given identical retinal size of the two angle arrangements– concludes that the “angle in”-line is shorter.